The New York Yankees entered the 2018 season in World Series or bust mode. However, they ended up settling for a wild-card spot and losing to the rival Red Sox in the ALDS. 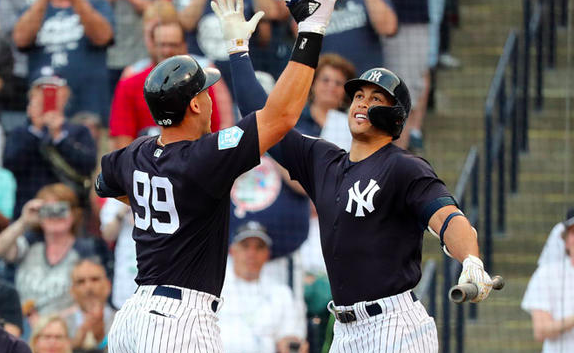 On the bright side, 2019 is a new year for the Bronx Bombers, who will fancy themselves as being stronger than last season. Do the Yankees have what it takes to win their first championship since 2009 or will they fall short yet again? The Yankees have made a concerted effort to improve their rotation from last season. After trading for JA Happ last summer, the Yankees re-signed the veteran southpaw who has registered an ERA under 4.00 in four straight years. New York also entered the trade market and acquired fellow lefty James Paxton from the Mariners. Getting a full season worth of starts from those two will surely be an upgrade over the likes of Sonny Gray, Lance Lynn, and Domingo German. Meanwhile, the Yankees also bring back frontline starters Luis Severino and Masahiro Tanaka to lead rotation along with Happ and Paxton. Severino, unfortunately, will miss the first month of the season due to shoulder problems. But he has also won 33 games over the past two seasons and is easily the team’s best starter when healthy. The silver lining is that top pitching prospects like Jonathan Loaisiga, Chance Adams, Albert Abreu, and Domingo Acevedo are all close to being ready to contribute in the majors, giving the Yankees several options to fill Severino’s spot until he returns. Veteran C.C. Sabathia is also back for one more big league season to help round out the rotation. The Yankees are also hopeful that Jordan Montgomery may be able to make a return from Tommy John surgery the second half of the season. With Montgomery possibly coming back and some intriguing prospects in the upper levels of the minors, the Yankees should have enough depth to get through the season with one of the better rotations in the American League. The Yankees were carried in part last season by their bullpen, and GM Brian Cashman has made sure the team’s bullpen is capable of doing the same in 2019. Aroldis Chapman remains the closer after another stellar 2018 season and Zack Britton was re-signed to team up with Dellin Betances as the team’s top setup men. The Yankees also signed Adam Ottavino to help replace David Robertson and give them even more quality in the late innings. In addition to that quartet, the Yankees have plenty of quality bullpen arms in the organization. Tommy Kahnle is a proven commodity despite a terrible 2018 season. The Yankees also got a lot of good innings from Chad Green and Jonathan Holder in 2018. Those two should be trusted again to provide quality depth. It’s also possible for the Yankees to use some of their younger pitchers out of the bullpen if they don’t need them in the rotation. If there’s one certainty about the Yankees this year it’s that there’s no shortage of talented arms in the organization. Only the rival Red Sox scored more runs than the Yankees in 2018, and the Bronx Bombers should once again be among the highest scoring teams in baseball this year. The Yankees return five players who hit at least 24 home runs last year, and that doesn’t include Didi Gregorius, who is set to miss the first half of the season. With the likes of Aaron Judge, Giancarlo Stanton, Miguel Andujar, and Aaron Hicks, the middle of the lineup will pose serious problems for opposing pitchers. There’s also the first base tandem of Luke Voit and Greg Bird, not to mention the possibility of catcher Gary Sanchez getting his act together after a rough 2018 season. In addition to all of the pure power hitters in New York’s lineup, 22-year-old Gleyber Torres is also a candidate to do more with the bat after posting an OPS of .820 as a rookie last year. Veteran outfielder Brett Gardner will also have an important role to play. The Yankees also have a couple of X-factors in the outfield with youngster Clint Frazier and the injury-prone Jacoby Ellsbury still with the team. However, the Yankees can probably survive if they don’t get much from either player. Ultimately, the only question in their lineup other than Sanchez turning things around is whether Troy Tulowitzki will be able to hold down the job at shortstop until Gregorius returns. Of course, the addition of D.J. LeMahieu should help the Yankees manage any injury or performance concerns in their infield. For the Yankees, the 2019 season is all about staying healthy. While they have enough depth to survive some injuries, the Yankees could be the best team in baseball if they remain healthy and everything clicks. After winning 100 games last year, look for the Yankees to go 106-56 this season, turning the tables on the Red Sox by winning the AL East and entering the postseason as the favorites in the American League to reach the World Series.